Home / FAQ / The Estimated Inbound Shipping cost is not calculating correctly – what do I do? The Estimated Inbound Shipping cost is not calculating correctly – what do I do? 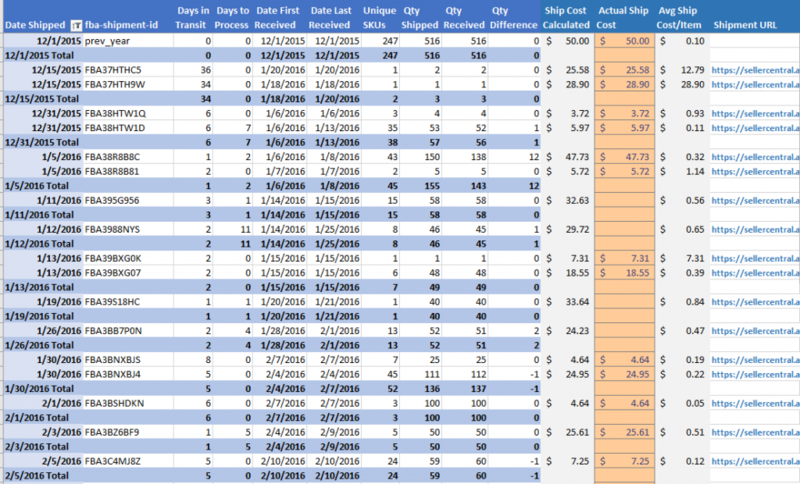 On the FBA Shipping Data sheet – check to make sure the Ship Cost Calculated column is populating. It is only populated if the Date Shipped is the previous day that you were charged for the shipping (or if you fill in Actual Ship Cost). This data is only available in the sales data and shows up as “FBA Amazon-Partnered Carrier Shipment Fee”. If there was more than one shipment on the same day, the total shipping cost is added together, and the sum of the Qty Received (total qty for that date) is averaged to get Avg Ship Cost/Item. The dates in “Import Shipping SKU Lists” are missing or incorrect. This could be because the dates were removed from the shipment name when the shipment was created, or the dates are in a format that the spreadsheet does not recognize. (it will recognize US and UK dates, and dates in the format 1/1/17, 1.1.17, and 1-1-17)Normally the Name of a shipment looks like this: FBA (1/1/17 12:00 AM) We recommend, when creating a shipment in Seller Central, to leave the date in tact. If you do not have dates in your shipment SKU lists (tsv files), the only way to fix this is to edit the files and enter the date manually next to “Name” in the .tsv files. Unfortunately, there is no other way to get this date from Amazon data. Worst case, your “Days in Transit” will be incorrect. *Update for v2.23 – If you are using the auto-import & dates are not formatted correctly in the TSV files, the spreadsheet will use the dates directly from the Amazon FBA Shipments page. The Actual Ship Cost will populate automatically with the auto-importer when clicking to update all data, just the FBA shipping data, or by clicking “Auto Import Shipping Costs” on the FBA Shipping Data sheet. The manual processing fees and labeling & prep fees are added into the total shipping cost. “Actual Ship Cost” can be manually entered on the FBA Shipping Data sheet if you want more accurate shipping cost per item. Cells that are red in column BD need a value filled in. The shipping cost can be viewed by copy/pasting the URL in column BF into a browser, then see Service Fees (at the top), “Amazon Partnered Carrier estimated shipping cost:” Be sure to add any manual processing fees and Labeling & Prep fees into the total. Previous post: How do I tell Amazon to give me a refund on the items lost or damaged? Next post: I’m in the UK (or other country) looking at my US Data, and it is not filtering by date – how do I fix this?